This nutritious salad is made with beetroot, dill, and walnuts. 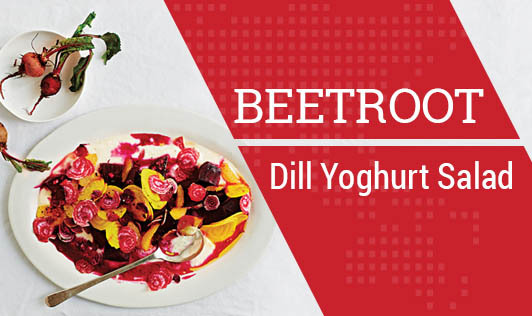 Rich in soluble fiber beetroot helps in preventing constipation whereas yoghurt and walnuts add protein and good fat to your diet. In addition to this, it also contains dill which adds vitamin C and flavor to the dish. Pressure cook, the beetroot (1 to 2 whistles) and keep aside to cool. Once cool, peel the beetroots and cut them into thin slices. Beat the hung curd with a beater until smooth. Add the chopped walnuts, beetroot, and green chili, and mix it all together.